72kg thrust with 125cm propeller, standard fit. Ready to fly with pull start Nitro, prop, carabiners, spark plug, harness, fuel tank, everything but the fuel. 19.1kg Titanium with HD 16mm outer hoop. This lightweight chassis is constructed of T6 aluminum and powder coated in white. It has very good mechanical strength, a very comfortable SupAir harness w/reserve chute mounting, 3K carbon fiber spars and seat board, carbon fiber prop and option of either a 130CC or the new Nitro 200CC motor. Standard configuration includes titanium weight shift arms, however fixed j-bars are also available. This frame is designed to meet the budget minded pilot who still enjoys a reliable and high power to weigh ratio machine that is both aesthetic and ergonomic. The 130CC engine generates 145 lbs static thrust, while the Nitro 200 motor generate 165 lbs static thrust. Made of G9 titanium (50% lighter than stainless steel), this robust frame is only 5.5lbs. It features 12mm narrow profile tubing through out and ergonomic cantered design for improved flight dynamics. 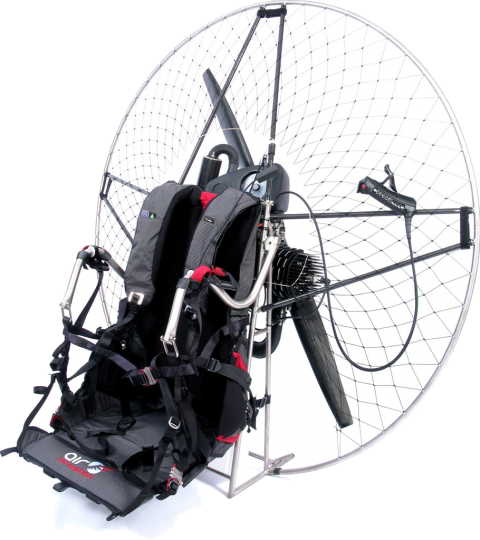 Includes comfortable Supair harness, 3k carbon fiber spars and seat board, carbon fiber propeller. Standard configuration includes titanium weight shift arms, however fixed j-bars are also available.